I already own a Hilux. 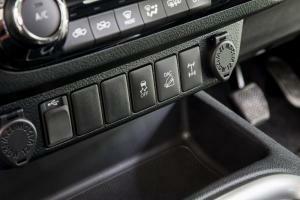 It’s a 2012 model, and over the last five years, it’s been stereotypically dependable. It survived a high-speed impact with an errant deer largely unscathed, and regularly tugs a full payload of logs out of muddy forests. But it’s not been perfect. A part of the dashboard has never fitted properly, despite being replaced under warranty, it needs new brake calipers due to electrolytic corrosion and poor design, and a nasty clutch judder from cold that’s been apparent almost since new has now worsened into the realms of the catastrophic. 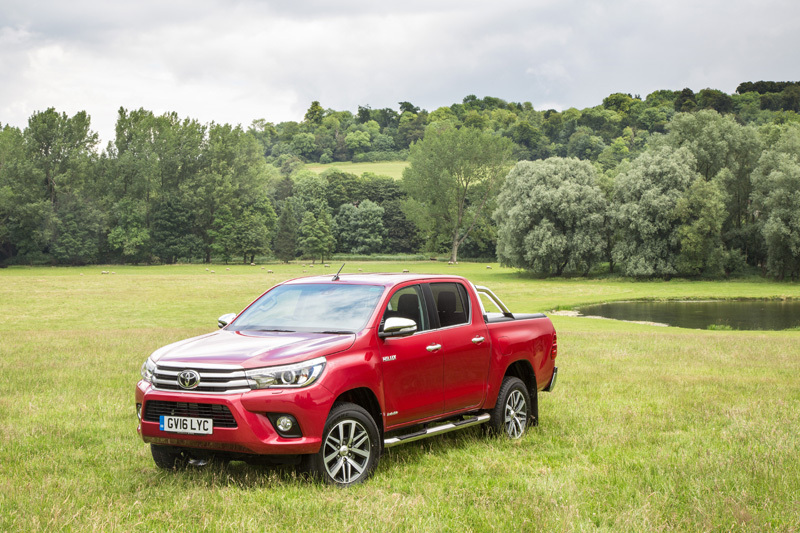 Combine all that with the fact the next service is The Big One™ and I find myself contemplating its replacement, conveniently placing me in the same boat as everyone else Toyota wants to target with their latest Hilux. 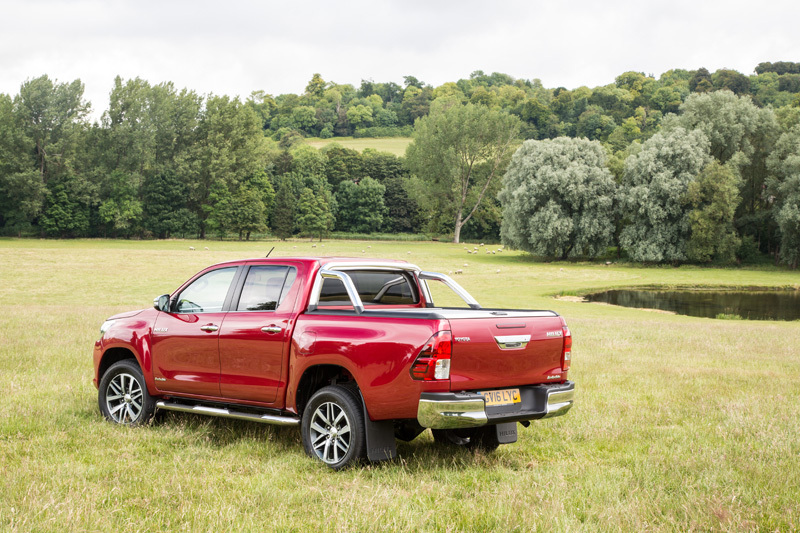 From the outside, the new Hilux is certainly striking, and to my mind the front has more than a passing resemblance to a Cylon from Battlestar Galactica. The interior, too, is more than a little spacey, with a huge metallic slash across the dashboard, vivid blue illumination everywhere, and a media system that appears to float some distance from the fascia. 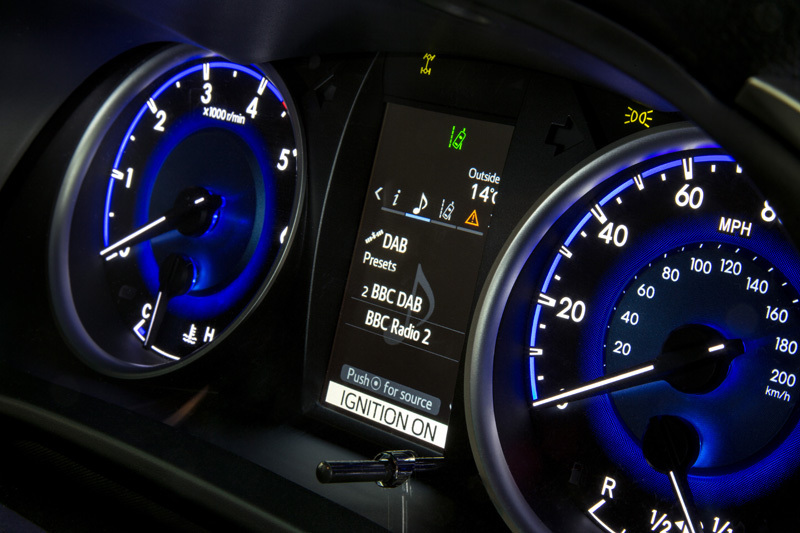 The system itself works well enough, but its interface lacks finesse, it’s slow to respond to touch commands, and the navigation function on our car kept reporting that it was unavailable. 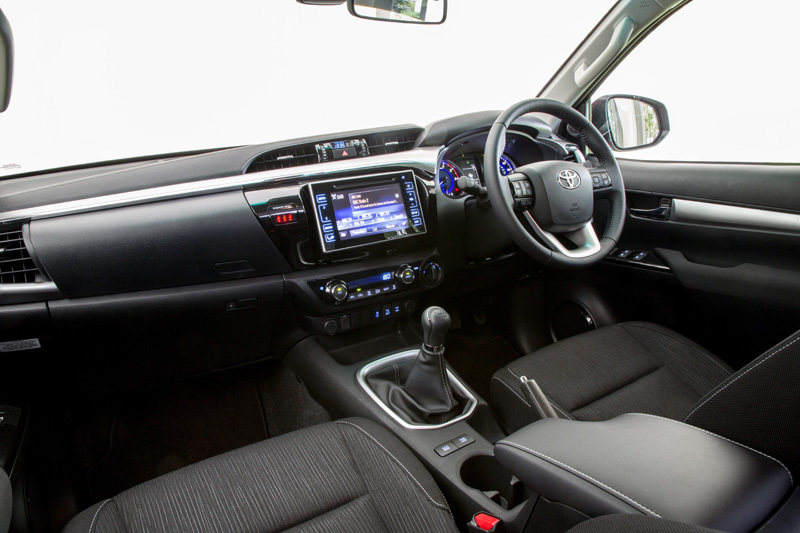 While the new interior is now a far more comfortable place to sit thanks to a wider range of adjustment in the driving position, and – at last – both height and reach adjustment for the steering wheel, there’s a sense that overall the Hilux has lost some of its workman-like resilience in favour of a more car-like persona; a working vehicle is no place for gloss black plastic switch surrounds, for instance. 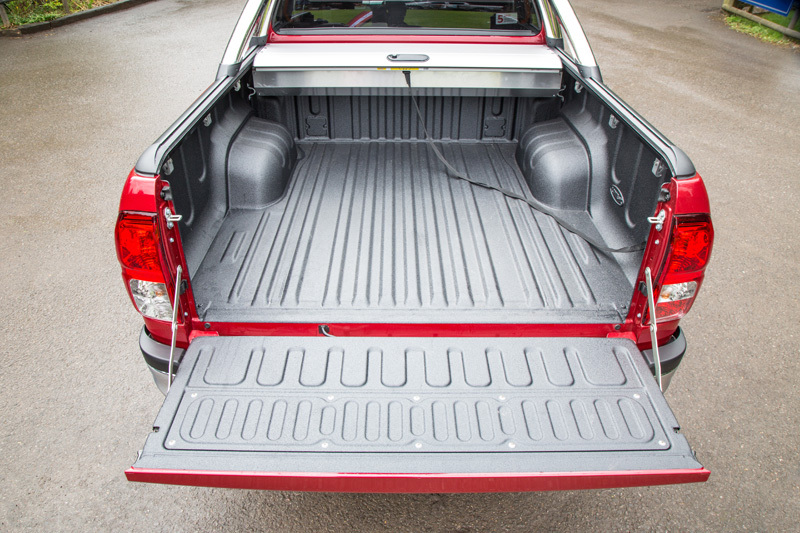 There are still plenty of practical touches – we like the second glovebox and the cargo hooks on the seat backs – but some areas are less successful: the new rear seat squabs are steeply angled, giving rise to an uncomfortable knees-around-your-ears seating position, and the new split folding arrangement means you now have to lift both of them individually to gain access to the underfloor compartments. The rear headrests obscure far more rearward vision than the previous model, too. Out on the road, things are more positive. The ride is noticeably better controlled, even when unladen, while both wind and road noise are well insulated from the cabin. 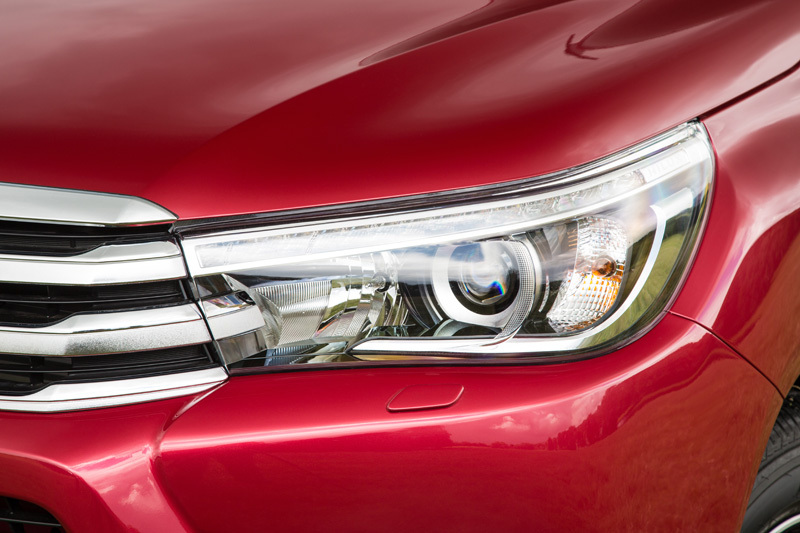 In the UK, there’s only one engine option – a 2.4-litre turbodiesel with 148hp. Although that’s near-as-damn-it the same as the outgoing 2.5-litre unit, it does produce more torque, with 400Nm from 1,600-2,000rpm, up from 343Nm. There’s no 3.0-litre option this time around, and although a 2.8 with a more interesting 175hp is available in other markets, it’s not available in the UK. That will disappoint many, particularly now the Hilux has to compete against a 3.2-litre Ford Ranger and a 220hp 3.0-litre V6 Amarok. 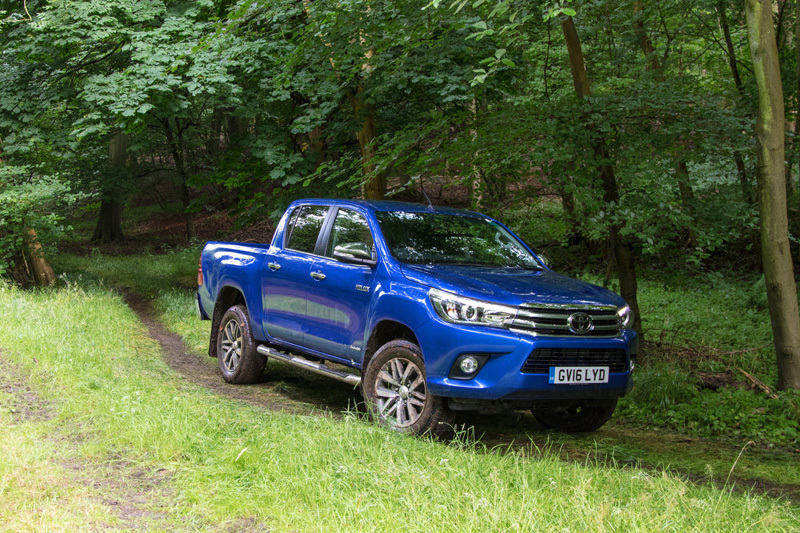 That said, the 2.4 does present a decent account of itself, but as its somewhat narrow peak torque figures suggest, it’s a little all-or-nothing in its delivery. 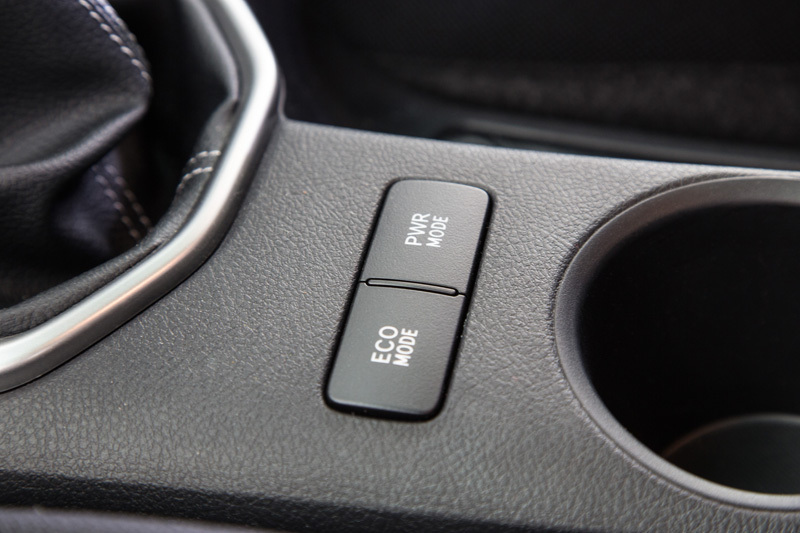 A new ‘Power’ button by the gear-lever only accentuates this by ramping up the initial throttle response, but once 2,000rpm arrives it all trails off fairly quickly. 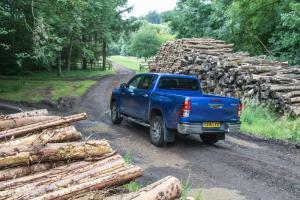 We drove the Hilux with a six-speed manual gearbox, and despite the heavy clutch it offered quite a pleasing gear-shift action. 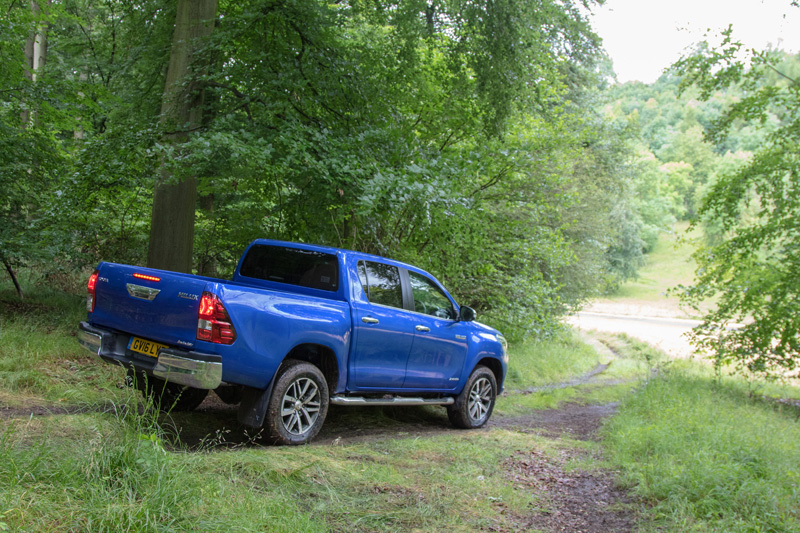 We felt the new ratios were a little on the tall side, perhaps due to the new taller final drive, and that may affect its off-road and towing ability. On top of which, the new Hilux is also only rated to tow 3.2 tonnes at a time when the competition can manage 3.5, although Toyota say that’s due to change. The brakes on my Hilux have always been atrocious, so we were pleased to discover this new model offers substantially more bite and power overall, despite still making do with drums at the rear. 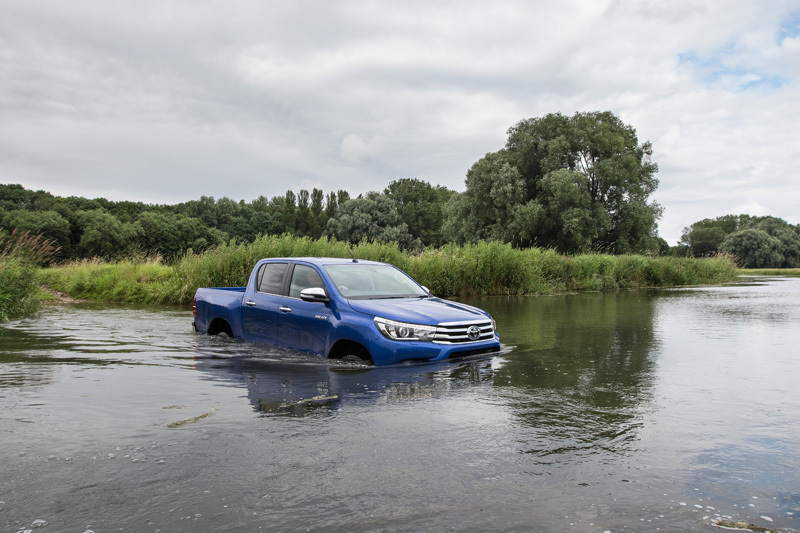 Steering is still hydraulically assisted, though, and we’d have liked to have seen a variable assistance set-up that offered lighter steering at parking speeds to aid manoeuvrability. Toyota claim the new Hilux is a tougher and more capable off-roader than the previous model, quoting a one degree increase in the approach angle, and a four degree improvement in departure angle. Be aware, however, that Toyota quote a wildly optimistic figure for ground clearance. That said, longer leaf springs are said to allow greater rear axle articulation, something borne out by our admittedly brief off-road testing. 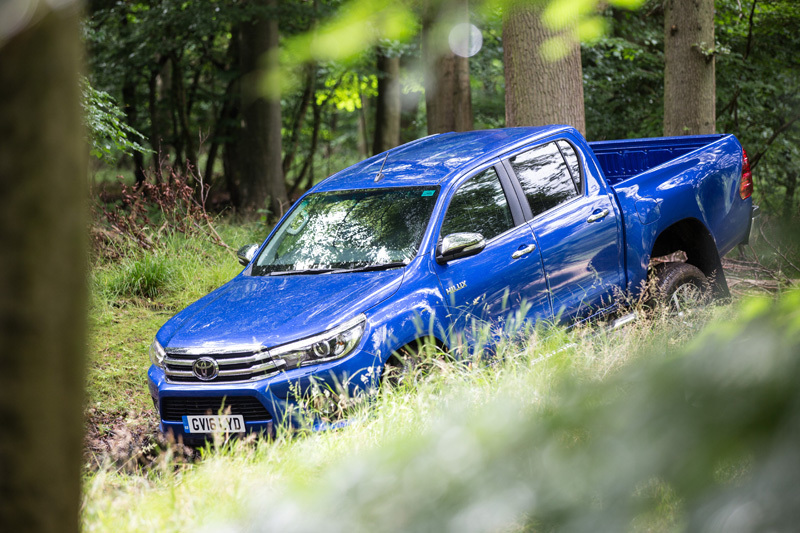 The new Hilux comes equipped with an electrically locking rear differential across the range, something that’s missing from some rivals such as the Isuzu D-Max, while the transfer case gear lever has been replaced by a simple rotary control. It’s still a strictly part-time system, however, with no full-time mode as you’ll find on the Mitsubishi L200. 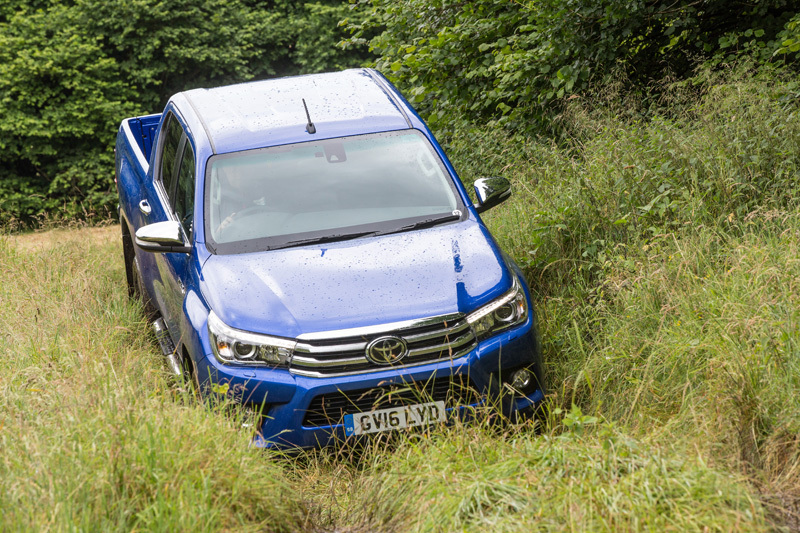 Strangely, Toyota say you can now only engage 4WD on the fly below 31mph, whereas the old model allowed the switch up to 50mph. There is, however, a new Downhill Assist Control system, to go along with other driver aids of Trailer Sway Control, Hill Start Assist, and a new Traction Control system. Prices have unsurprisingly taken something of a leap to pay for all this, and whereas the previous Invincible would have cost you £26,355, this new model will set you back £29,850 at retail. It does at least qualify for Toyota’s 5-year 100,000-mile warranty which the old model didn’t. So does this latest Hilux continue where the previous model left of? 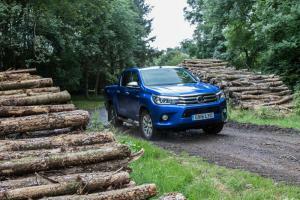 It’s undoubtedly nicer on the road and more comfortable over long distances, but there’s also the sense that it’s lost some of its trademark toughness, particularly in the cabin. However, it’s the decision not to import the 2.8 that’s likely to be the deciding factor for many. 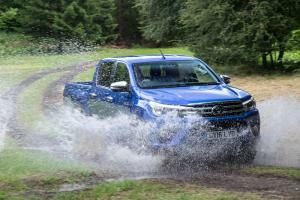 The outgoing 3.0-litre out-sold the 2.5 by some margin, and not offering a similar option – particularly in the face of more powerful competition – risks forcing even Hilux diehards to look elsewhere.